Today on our list: 8 ranch house plans inspired by Cliff May — available, like the others, from houseplans.com. Wow, those historic-minded folk at houseplans.com are working overtime, it seems. While these are not original Cliff May plans — they have been updated for current building codes — they are “Cliff May-inspired” — and that’s important because Cliff May is the father of the modern day ranch house — at least according to Pam’s research. So, just as we bow to Royal Barry Wills when we discuss mid century Cape Cod and colonial homes, we bow to Cliff May when we discuss ranch houses. So, its now very cool to have these 8 designs (with even more variations) working to faithfully to bring the May aesthetic to a whole new generation. Cliff May was not the only ranch house designer but he was the most influential, thanks to his gift for innovation, canny salesmanship, and flawless timing. He popularized a seductive — even glamorous — and yet very practical concept of California living. It combined the romance of history with an almost scientific approach to modern living. Among the features he perfected were the slab foundation, the sliding window wall, the vanity, and the ridge skylight. He was most active during the boom years of the 1950s and 1960s. Cliff May personally designed more than 1,000 homes and commercial buildings, including the offices of Sunset Magazine (1951) and the headquarters of the Robert Mondavi Winery (1966). In addition, more than 18,000 designs, including “Low-Cost” tract ranch houses, are attributed to his office. One such tract development — the Long Beach Ranchos in Southern California — is experiencing a renaissance thanks to the efforts of Cliff May enthusiasts and realtors Rochelle and Doug Kramer — their website is ranchostyle.com. A typical Cliff May house is one story, no more than one room-wide, appears to hug the ground, and incorporates outdoor space with patios and terraces under broad overhangs. Walls are stucco or board-and batten or both; shallow gable roofs are tile or shake. Layouts often take the shape of an L or a splayed U. He compared a floor plan to a piece of rope that could be twisted around to suit the lot. I have always been interested in ranch houses and as a writer and editor at Sunset magazine for many years I worked in the wonderful Menlo Park, California campus — really an over-scaled ranch house in a seven-acre garden — that Cliff May designed for Sunset with landscape architect Thomas Church. I often wrote about ranch houses, so it seemed natural to learn more about Cliff May. I also interviewed him for a symposium in honor of his 80th birthday. 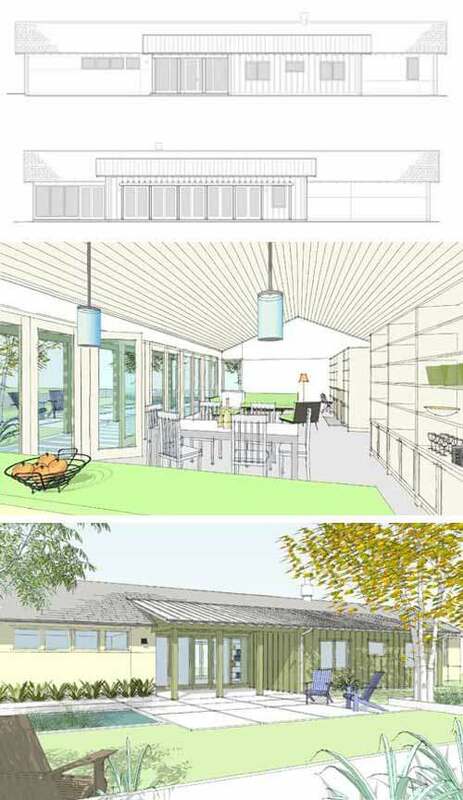 Above: Plan #445-1 is a BASIC PLAN (Flexahouse) with five more variations below — all by architect Nick Noyes. This building block design is 2,254 sq. ft. and “I” shaped — making it great for narrow lots. 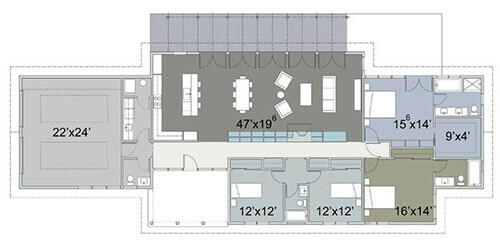 Above: Plan #445-2 is 2,618 sq. ft. and also “I” shaped — for those with narrow lots that want more square footage. 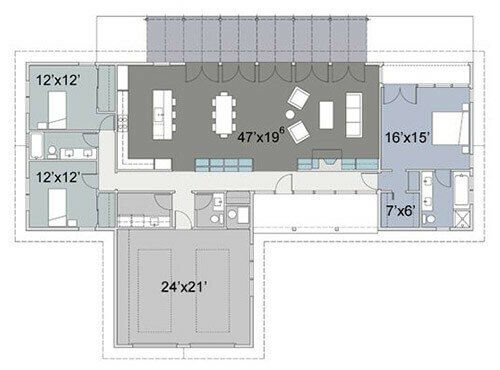 Above: Plan #445-3 is 2,405 sq. ft., “L” shaped and suitable for a wide lot. 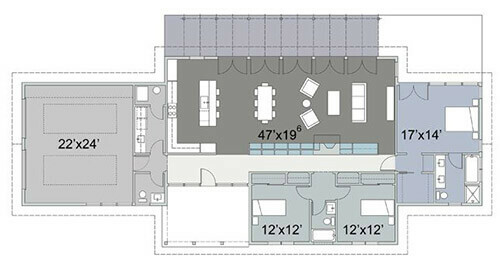 Above: Plan #445-4 is also “L” shaped but larger — at 2,778 sq. ft. Above: Plan #445-5 is “T” shaped, 2,338 sq. ft. and suitable for a medium sized lot. 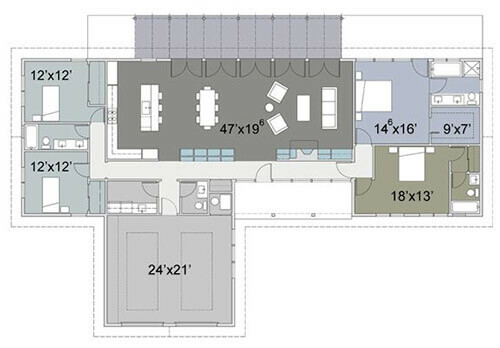 Above: The final — Plan #445-6 — of this plan is also “T” shaped and suitable for a medium lot at 2,580 sq. ft. Above: If you’re in the market to build for a large Cliff May inspired home — plan #48-433, this 5,884 sq. ft. plan is sure to amaze. Above: This plan (#64-170) — charmingly referred to as the Azalea by designer Dan Tyree — is designed for a medium suburban lot. Above: At 2,517 sq. ft., this plan (#64-172) is called Proximity — also by designer Dan Tyree. Its floor plan allows for cool breezes to pass all the way through the main part of the house. Above: This May inspired house plan (#436-1) by designer Rick Faust focuses on space saving built-in details and sheltered outdoor patios. 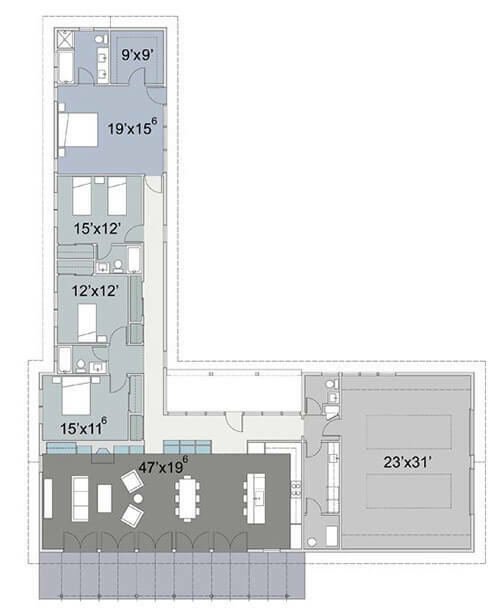 Above: This 3,392 sq. ft. plan, “Rancho Blanco” by designer David Cox (#449-15) has several patios and a guest suite or studio with its own private bath. There is one more Cliff May inspired house plan available on Houseplans.com — see my story on this plan here. We hear directly from the plan designer about the differences and similarities between his plan and an original Cliff May design. We also hear how Cliff May has continued to inspire this architect career. Want to know more about the key features of “true ranch houses”? <– See this story Pam wrote a few years ago. 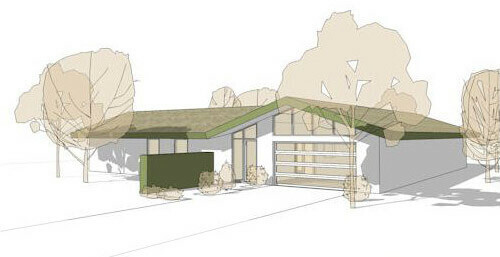 See all our stories about historic mid century house plans available again for sale today. I love them all, but that very first, the 445-1, is my ideal of a perfect house. Not too big, not too small, so well organized that all rooms make perfect sense, and with the garage set so you could change the drive to the front or back if you wanted. LOVE it. Some of these are nice, but I much prefer the Eischer designs that were put up earlier. I am not a fan of open concept floor plans, and I especially don’t like having the kitchen totally open to the rest of the house. I have to agree with you. I lived in a house with vaulted ceilings and a weird 3/4 wall between the living room and the kitchen. The vaulted ceiling meant that you could never hear the TV in the living room but you could hear it LOUD AND CLEAR in the kitchen because the sound would travel up and over that silly wall. On top of that, cooking smells travelled throughout the house, which is fine on Thanksgiving but I don’t necessarily want to smell burnt onions in my bedroom, if you catch my drift. I totally agree, I was looking at all these wide-open kitchens and thinking I’d HATE that. So impractical. To me, there were really TWO Cliff Mays– the custom builder who really popularized the sprawling, multi-winged uptake on the classic colonial California Working ranch house with all rooms arrayed around a rear courtyard , and the latter- day developer who teamed with Chris Coate to mass-produce accessible, upper middle-class tract homes of a much smaller size and footprint, using mass-production building techniques. While these two styles of homes undoubtably share many similar elements ( unified dining/family rooms, 3/4 height walls, rear or side elevations of the homes with floor-to-ceiling windows/doors), they are unmistakably different in terms of size,footprint and clientele. As portrayed in the Sunset books of May plans, the classic May ranch requires a huge amount of land to build upon, even given a relatively modest square footage. Even a fairly large residential lot these days wouldn’t accomodate a May home of 2400 sq feet or so,with 3 bedrooms and two wings angling from a central “core”containing the kitchen, family and dining room. And that was a small home for a typical May commission–some of these homes were well over 5000 sq. feet all on a single level. These homes may have been one room wide, but they extended in an L or W or even X, using the space between wings as couryards or patios. The 1957 Sunset book does present a couple latter-day May plans that squeeze the May Ranch into a narrow lot, reducing the house to a rectangle or shallow L shape. Often, a single carport is pressed into dual service as a patio right off the living room, a concept I would love to see in contemporary construction but unlikely given the value of cars and need for our garages to double as defacto storage units. 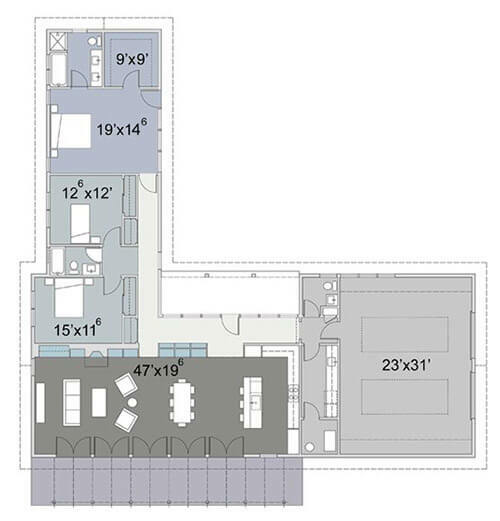 –unfortunately, “updated” with the great central room split in half with the additon of a middle all (a real shame!). But, the elements are all there to see its origin as a modest-sized May/Choate tract home. The plans listed above DO have May elements in them, particularly the 445 series homes, but I feel they borrow as much from the vibe of Palmer/Krisel, John Long of Phoenix, Frickett and Bohannon as well. If I were to build new, spending within reason, the Azealea has been on my radar for several months. It really has an early 60s design feel to it. Perfect! Thank you for all your insights, Blair!!!! Hooray for Cliff May and the growing popularity of the ranch house. 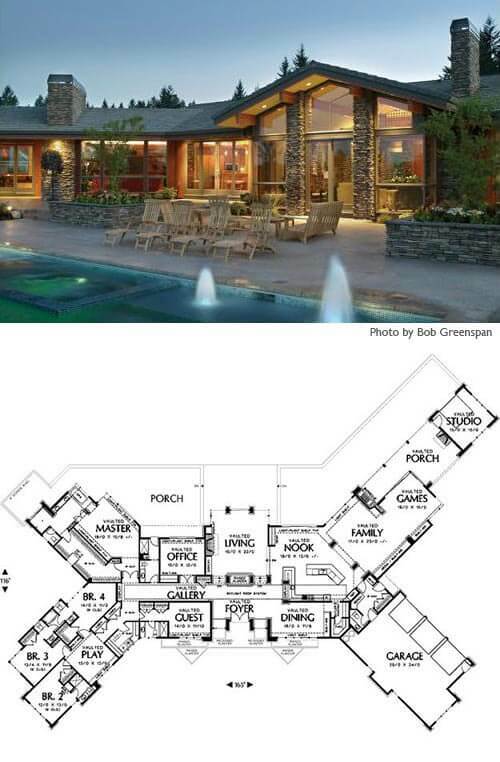 Cliff May designed homes to embrace the outdoors by using single-level plans that seamlessly flow indoors and out through numerous glass doors and windows. The small tract homes of just 1130 sq ft feature five sets of French doors opening to patio spaces on all sides of the home. The patios are extensions of the home that create a larger sense of space and freedom of movement. This combined with privacy fences creates a compound-like environment that captures more of the entire lot for personal use. My husband and I are Cliff May fans and homeowners since 1996. We share our passion for Cliff May through our website http://www.RanchoStyle.com that features many fine examples of Cliff May homes. You can also find Rancho Style on Facebook. 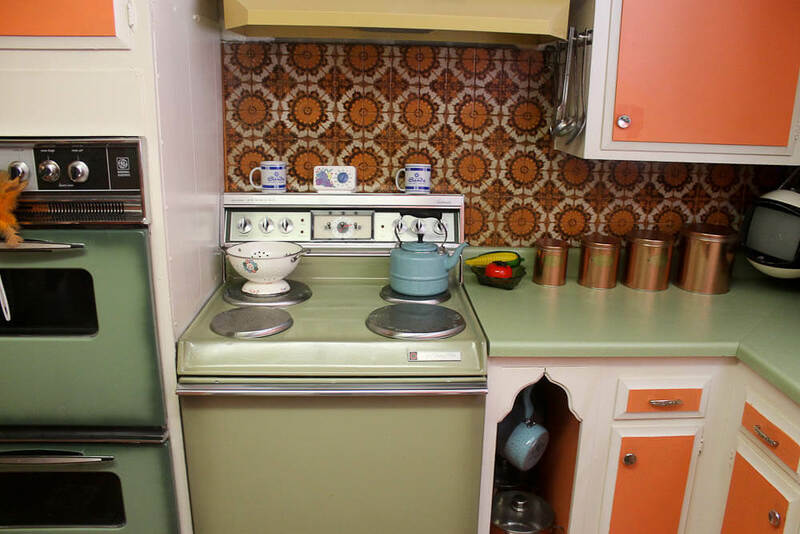 We appreciate the work of Retro Renovation to highlight design worthy of preserving or emulating. Thank you RR!